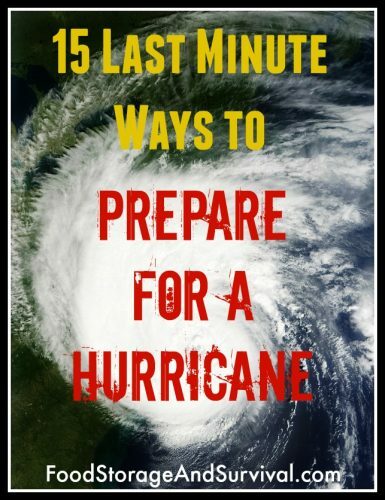 Hurricane season is upon us and for those in the storm path, preparation is key to getting through the storm in the best way possible. But what if you haven’t prepared yet? While it’s always better to be prepared ahead of time, here are 15 last minute things to do to help you be as prepared as possible! Monitor local news for updates–on TV, radio, or online. You may also be able to sign up for text alerts or emergency information phone calls through your local law enforcement’s reverse 911 system. Evacuate. If it’s not too last minute, and you live in an area that has received an evacuation notice, throw some survival supplies in your vehicle and get out of town. Your area may have a shelter set up for evacuations or you can head to a friend or family member’s house out of the danger zone. A great book to prepare for evacuations of all kinds is the Survival Mom’s No Worries Guide to Emergency Evacuations. Close and secure storm shutters or board up windows. 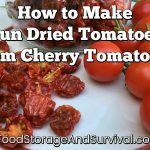 Check your supplies at home and determine what foods you can eat with little preparation and that don’t need refrigeration over the next few days. Hit the store for the things you’ll need. The most common items you’ll be needing are food, toiletries, and possibly feminine hygiene or baby products. Unfortunately, that’s what everyone else will be shopping for as well, so anticipate long lines and items out of stock. This store trip is best done a week or more before the event, and I usually recommend staying away from stores in the hours leading up to a known disaster, but if you really need some supplies, go ahead and see what you can find. You may get lucky. Eat foods that will spoil or melt all over everything and ruin other foods if your power goes out. Fill water containers. Here are the the pros and cons on some of the most common water containers. Freeze some water containers to be used as ice blocks in your freezer or refrigerator in the event of a power outage. Find flashlights and make sure they’re charged. Need more light? Here are nine great emergency light sources other than a flashlight. Charge your cell phone. If you have a charging phone case or portable phone charger make sure they are charged up as well. Fill sand bags. If you’re in an area that is expected to have flooding, get ready now to keep your home from getting wet. Move light weight yard furniture and decorations indoors to keep them from sustaining damage or becoming projectiles. Fill your gas tank. And a gas can if you can. As with the trip to the store, this is really best done long ahead of the storm’s arrival. Many stations will run out of fuel in the days leading up to the hurricane’s landfall, and most won’t be able to pump if the power goes out. Refill prescriptions. If you are evacuating, send your prescription to a pharmacy out of the evacuation zone and near where you are evacuating to so you can get out of town faster. Check on your neighbors–especially elderly or those with special needs or who may not be connected to news sources. yet another very predictable disaster and the chickens with their heads cut off are running loose …. sheeple with absolutely no capacity to learn …. Here a few additional tips I will suggest. If you do not have generator and even if you do the follow will conserve your fuel and your food. 1. Precook all of your meats and refreeze the meat in the Freezer .Precooked, meat will last longer then raw meat. 2. Purchase the largest metal bowl you can find. 3. Purchase 3 or 4 large bags of ice. 4. Place your soda and water in the refrigerator before hand to pre chill them. 6. Freeze a gallon or two of milk it will last longer frozen when thawing just remember to remove a in or 2 of milk bore hand. As soon as the power is out go into action. 1. Fill large metal bowl with ice place bowl on top shelf in your refrigerator. 2. Place precooked frozen meats on top Shelf of refrigerator along with Frozen milk you can allow milk to thaw a little by sitting it out for 30 minutes to a hour or so. 3. Remove a all Sodas and water bottles and place in a Ice chest with ice. The above method will buy you a few days and with a Generator a more days. We have to two refrigerators an small chest freezer. What you just made a is a basic old fashion Ice Box using a modern refrigerator. I’ve been hearing a lot of blast minute preps lately. It’s really got me thinking. One site recommended keeping your phone, keys, and wallet where you can get to them fast if you house burns down. Imagine losing your car, your ID, Credit cards, and any way to communicate with people at the same time you lose your home. They also suggested grabbing the clothes hamper because it might already be packed full of clothes. Water bottles can be frozen to keep coolers cool. We live near the Gulf coast in Texas. What you have to remember is that “if” you evacuate you have NO control when/how/why you are allowed back into your property. If you leave animals etc. behind you don’t know when you will be allowed back onto your property. So, before you evacuate make certain “everything” is in order because you don’t know when you will be back. Just because the storm is over there is absolutely NO guarantee when you will be allowed back into your property/neighborhood/county. You would think you would have control over that but do not count on it!! !